The Moroccan government said on Monday it wants to cuts its 30 percent stake in Maroc Telecom to as low as 23 percent by selling the shares through the Casablanca bourse, Reuters has reported today. The finance and economy ministry said in a statement that on Sept. 7 it would open bids it had received by financial firms to advise and lead the sale of up to a 7 percent stake in Maroc Telecom. It did not say when it expects the transaction to be completed. 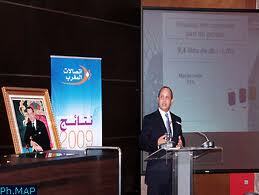 The stake is worth 8.86 billion dirhams ($1.10 billion) based on Maroc Telecom’s closing stock price on Friday. Tourism receipts over the same period rose 9 percent to 24.7 billion dirhams and migrant remittances climbed 7 percent to 26.7 billion dirhams, data from the Office des Changes foreign exchange regulatory authority showed, mitigating the potential impact on the availability of foreign currencies.